The unique demands of the public procurement process place a high level of importance on transparency and auditability. Any public procurement professional understands that an off-the-shelf procurement solution designed for the private sector won’t meet their needs. Through our service to public sector procurement clients since 2000, we have developed a deep understanding of the public procurement process that is embodied in the capabilities of the ProcureWare platform. Allow vendors to easily self-register and indicate their interest in being notified of relevant bid opportunities. Promote specific outreach efforts for inclusion of diverse suppliers, track their participation in sourcing events, and report on contract awards. Streamline distribution of large bid document collections associated with engineering, services and construction procurement with convenient drag-and-drop features. 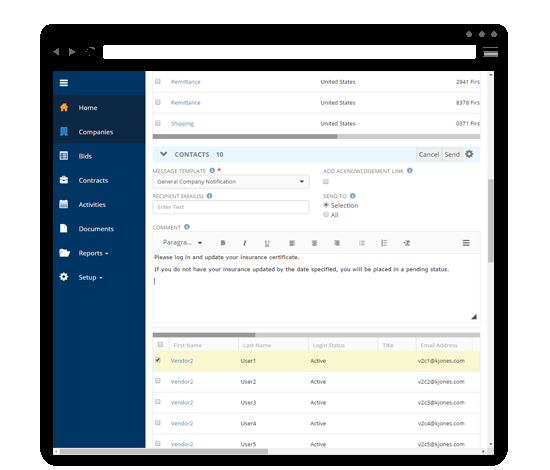 Use the built-in messaging system’s customizable templates, log notifications, and track message delivery and receipt acknowledgement. ProcureWare automatically updates the bidders list with interested bidders and allows the buyer to optionally post the list for public view. Technical and pricing responses can be opened in a single-step or two-step process only after the due date. 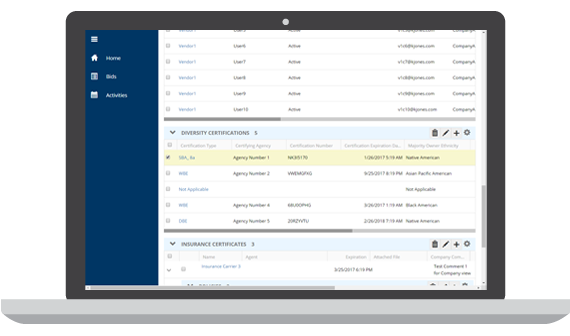 ProcureWare logs all system transactions and modifications to enforce compliance and transparency in the public procurement process.